Lama Karma Thinley Rinpoche, along with some students of Kalu Rinpoche and Chögyam Trungpa Rinpoche, started Kampo Gangra Drubgyud Tekchen Ling in 1973 in a house on Scollard Street in the city of Toronto. The following summer, His Holiness Sakya Trinzin visited and gave Naro Kachöma Blessing. Later, the Centre moved to a house on Spencer Avenue where His Holiness the 16th Gyalwang Karmapa visited and gave blessings and several initiations. It was at that time that he made Karma Thinley Rinpoche head of Drubgyud Ling, and gave him the title Garchen Chöje Lama, along with a letter of authority. Kalu Rinpoche also visited and gave teachings. At another time, Chögyam Trungpa Rinpoche visited and gave teachings, and he also performed a Karma Pakshi ganachakra puja. Karma Thinley Rinpoche designed the Drubgyud Ling logo with a double dorje as its base, topped with a Canadian maple leaf and a white ten-spoke dharma wheel with a wheel-of-joy (ga-kyil) at its centre, and a dorje above. 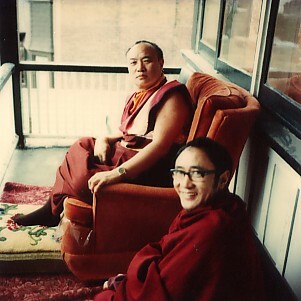 In the Fire Dragon year, 1976, the Centre purchased a house in the Beaches district, in the east end of Toronto, and Lama Karma Thinley Rinpoche named it Tekchen Podrang (Mahayana House). 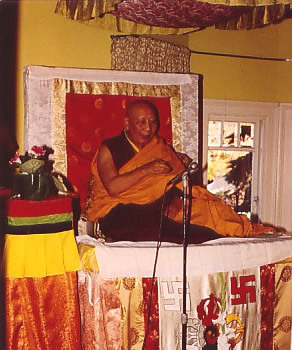 In 1977, His Holiness Karmapa visited and resided at Tekchen Podrang for ten days. 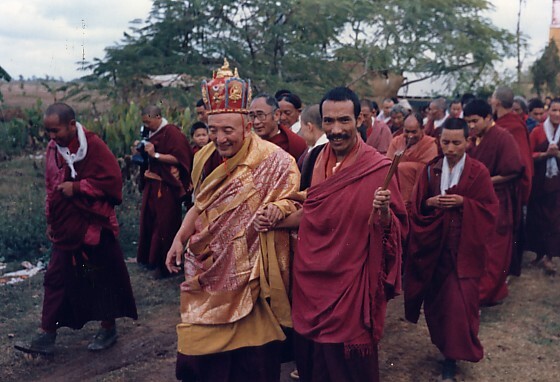 During this time, he gave teaching and initiations, and during his next visit in 1980, he gave a special Mahamudra transmission and pointing-out instruction. His Holiness also had Mahakala tormas made for the pujas; these are still preserved on the centre shrine. His Holiness Sakya Trinzin visited and gave teachings and the initiation of Za Yum, (Mother of Planets). Since then, the practice of the Earth Healing Puja continues to be upheld for world peace. Kyabje Dilgo Khyentse Rinpoche resided at the Centre for seven days and gave Vajrakilaya and several other initiations, as well as the reading transmission (Jak Lung) of Sheza Kunchob, a commentary in three volumes of Jamgon Lodro Thaye’s Encyclopaedia of All Knowledge. Kyabje Ling Rinpoche visited and gave a special Lojong transmission and teaching. Kyabje Kalu Rinpoche also visited and gave initiations and teaching. Nyoshul Khen Rinpoche came and gave teachings on Dzogchen. 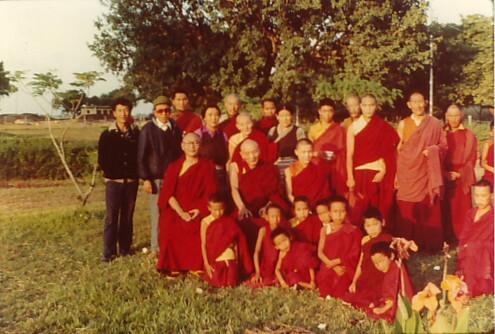 In 1981, Shamar Rinpoche gave the transmission for the Madyamikavatara commentary. T'ai Situ Rinpoche visited several times and gave teachings and initiations, including a special Maitreya Buddha initiation. Jamgon Kongtrul Rinpoche also visited on several occasions; he gave teachings and initiation of White Tara, a special Singhamukha from the lineage of the First Karma Thinleypa, and Thousand Armed Chenrezig for Nyungnay. Some other great Rinpoches also visited and gave teachings and blessings. Lama Karma Thinley Rinpoche founded Marpa Gompa Changchub Ling Buddhist Meditation Society in Calgary, and appointed Susan Hutchison as Chöge (dharma teacher). 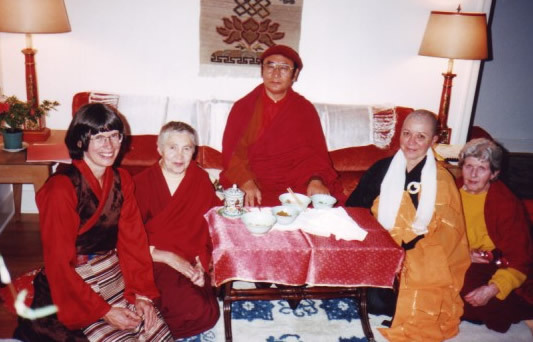 Susan is a Buddhist scholar and practitioner, and Rinpoche later named her Jetsün Rigdzin Khandro. She has translated, transliterated, and published many sadhanas (pujas), including the Könchok Chindü, the Amitayu long sadhana (Tsedrub Sangwa Düpa), Mahakala, the Chogyur Lingpa treasure dharma Guru Rinpoche sadhana (Thinley Dringbo), and the short Kachöma sadhana, ganachakra, and short Sakyapa dharma protectors puja. She also published the Vajra Kilaya Sadhana (Sangtik Phurba) together with the Elimination of Hindrance Ceremony book, and the long Vajrasattva sadhana (Sangtik Dorje Sempa). Other works that she has printed include the Shiteng commentary of Nagarjuna’s Letter to a Friend, and Rangjung Dorje’s Small Commentary Distinguishing between Ordinary Consciousness and Primordial Wisdom, as well as a special long life prayer to His Holiness Sakya Trinzin that Karma Thinley Rinpoche wrote in 2003, and the small song to his robin "neighbour" who day after day delighted Rinpoche with his beautiful song. In 1983, Zim Og Rinpoche and Karma Thinley Rinpoche requested and sponsored (Tib: jindak) the Drubtab Kundu initiations from His Eminence Chobgyay Trichen Rinpoche, Head of the Sakya Tsalpa sect, whose lineage of this full collection of Vajyrayana sadhanas is very special. This took place over a complete three month period in Lumbini, Buddha’s birthplace. Monks from all the Sakya Ngorpa monasteries in the Lomintang area attended, as well as many lay people. Zim Og Rinpoche and Karma Thinley Rinpoche offered food and lodging for everyone who attended the initiations. His Holiness Sakya Trinzin came to give the transmission of the Eighty-four Mahasiddhas, which is at the beginning of the Drubtab Kündü. At Karma Thinley Rinpoche's request, His Eminence Chobgyay Trichen Rinpoche wrote an index book of these teachings, and Rigdzin Khandro reprinted this for Rinpoche, using modern computer technology. She has also printed many other short works.